The National Football League’s regular season opens for the Cleveland Browns in just two weeks and, judging by what transpired Friday night against Philadelphia, the team has a long way to go to be ready. Rookie wide receiver Josh Gordon had three receptions for 50 yards, including a 28-yarder on the first play of the game. In three preseason games, Gordon has five catches; keep that pace up during the regular season and he will finish the year just four catches behind Brian Robiskie on the franchise’s career reception list. Cornerback Joe Haden had a nice interception on a deep pass from Eagles backup quarterback Nick Foles. The rush defense gave up just 55 yards, an average of 2.1 yards per rush. The numbers have gone down dramatically throughout the preseason, with the Browns going from giving up 198 yards (6.0 average) in the opener against Detroit, to 69 yards (3.8 average) last week against Green Bay to last night’s total. For what it is worth. The brown jerseys looked nice. The starting offensive line of Joe Thomas, Jason Pinkston, Alex Mack, Shaun Lauvao and Mitchell Schwartz were awful. They combined for two false starts, two holding penalties and allowed three sacks. The Browns had three turnovers, including two lost fumbles. The first fumble came on the opening drive when, after reaching Philadelphia’s 2-yard-line, Pinkston was called for a hold, pushing the ball back to the 12. 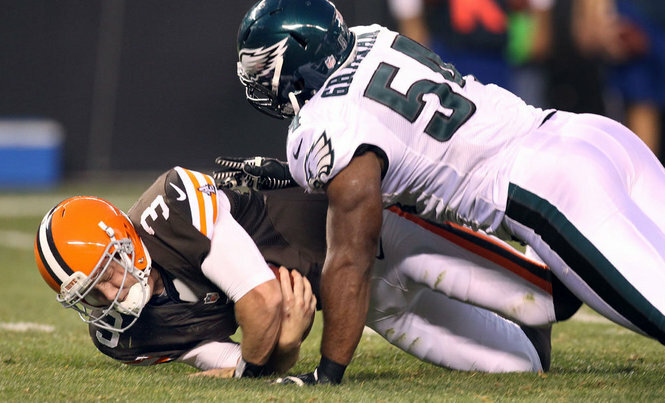 On the next play, the Browns tried once again to execute a screen pass, but quarterback Brandon Weeden was strip-sacked by Derek Landri and the Eagles recovered at the 30. It’s probably time for the Browns to take the screen pass out the playbook. The run game was non-existent, especially from Montario Hardesty, who finished with 12 yards on eight carries (a 1.5 yard per rush average) and lost another fumble. In three preseason games, the Browns are averaging just 3.3 yards per rush. Reggie Hodges had a punt blocked, leading to an extremely short Philadelphia (three yards) scoring drive. Defensive end Marcus Benard injured his elbow in the third quarter and did not return. He reportedly has the injured arm “heavily wrapped” and in a sling after the game. Back-up quarterback Colt McCoy threw a touchdown pass to back-up tight end Evan Moore. That will only lead to the hoople heads calling for McCoy (not a starter) and Moore (can’t stay healthy and not very good) to “get an opportunity” to play. “I am not sure we can say we did much good in that first half,” Browns coach Pat Shurmur told The Beacon Journal. “We turned the ball over. We gave up big plays. We did find a way to drive the ball, but you can’t turn it over. All of the things that you can’t do, we found a way to do it. It’s not good enough. Well, sure, the Browns can get it fixed, but the question is, will they get it fixed – especially in time for the regular season? The biggest thing the teams needs – especially on offense – is time together. It was obvious against the Eagles that Weeden and the receivers simply haven’t had enough time yet to work out what they need to do to be on the same page. There was one pass where a Weeden throw to Greg Little – who had plenty of room to turn up field and possibly have a big gain – was off just enough to wind up as an incomplete pass. Eventually the offense will get that play down, but when? There are only a handful of practices and just one preseason game (in which the starters probably will play very little or not at all) to get this all worked out before the season starts. Is that really enough time? The Browns better hope so. For better or worse, we are going to find out the answer come Sept. 9.